Thinking about buying your first home? Whether you’ve recently been married or you’re single and looking to mingle with some real estate, there’s no doubt that buying a new home is a pretty big deal. Our homeowners insurance experts have said it once and we’ll say it again: buying a home is, for most people, the most expensive purchase they’ll ever make, not to mention the most valuable asset that they’ll ever own. If you thought that buying a car was a hair-pulling, lengthy process, then you should know right now that buying a home is a much, much bigger deal. While we’re no real estate experts, Bradley’s Insurance knows more than a thing or two about homeowners insurance, and we’re here to help first time home buyers like you understand the ins and outs of both homeowners insurance in Ottawa as well as what to know when buying your first home. From Stittsville to downtown Ottawa and other places in Ontario, Bradley’s Insurance is here for you. Our flexible insurance policies are designed to align with your life situation whether you’re a young professional bachelor or a longtime married couple with multiple kids looking to finally settle down somewhere for the long term. Whatever your personal insurance needs are, you can count on Bradley’s Insurance to help. 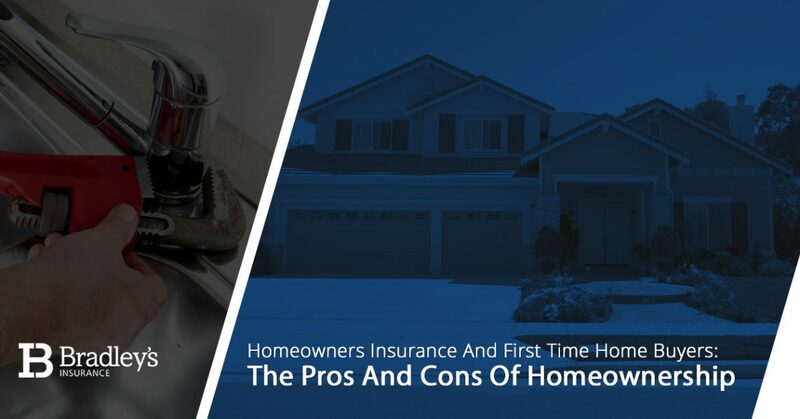 Check out our homeowner’s maintenance tips on this page, and feel free to read more about both of our standard home insurance and high-value home insurance policies that we can connect you with. Regret is one of the last things that you want to experience after purchasing your first home, so think location vs space through very carefully and buy a home based on where your priorities lie. Seriously — remember that we just said about avoiding regret at all costs when it comes to buying a home. Though budgeting your projected monthly expenses as a new homeowner is really important, there are other things that you’ll want to make sure of before you hand over your down payment, get a home equity line of credit, and start the final process. Things like job security, your credit score, and willingness to commit to living somewhere for a long period of time are all beyond worthy of consideration. Keep them in mind! Don’t have kids? Don’t plan on having kids? That’s completely fine, but investing in a home that’s located in a growing area with a well-known, high-quality school district is a good idea. Many future residents of a certain area will be moving there with their kids, and are willing to pay more to live in a place where they know their child will receive an excellent education. Who doesn’t want more privacy in their living situation? Sure, it’s not like people are going peep in your apartment windows (though this could very well occur), but living in completely separate buildings (single family homes) is a great way to enjoy more privacy. Having a fenced backyard with plenty of tastefully-planted vegetation only ensures greater levels of privacy. You can’t simply go from lease to lease and move around between different home rentals or apartment complexes. Therefore, it’s fair to say that homeownership involves a certain degree of less freedom compared to the freedom to move year after year without any complications. Though, to most homeowners, committing to a long-term living situation where you actually own where you live is completely worth it. There are plenty of notable freedoms that come with owning a home — you’re your own landlord at that point, after all! You might build a solid rental history by renting, but you’re never going to build any true equity that way because you don’t own anything. Owning property is the most common way to build equity, as over time with each mortgage payment that you pay the bank, you’ll slowly own more and more of your house. 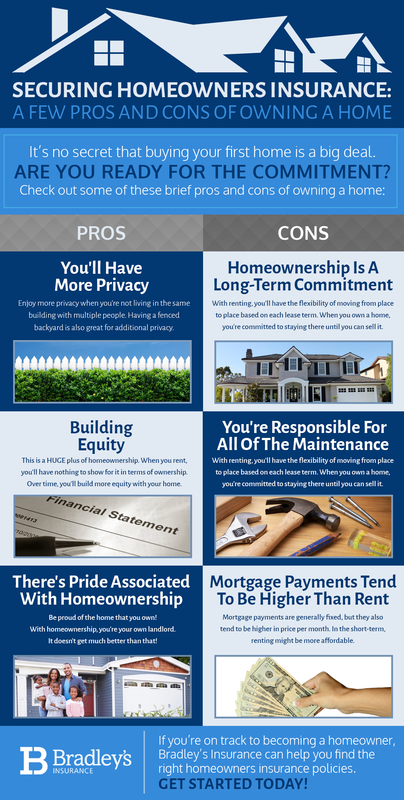 With the ability to sell your home for a nice profit down the road (assuming you’re in an area where the housing market is going up in value), owning a home just makes sense when you look at the long-term picture. No more calling your apartment maintenance crew to fix that leaky sink or replace that broken window screen. After you buy your first home, it will be time to put on your grown-up pants and fix things on your own. Now, you can always choose to call a repair service nearby that specializes in whatever needs to be fixed, but unlike what’s included in the rent that you pay for at an apartment complex, these fixes are almost sure to come out of pocket. Look around you. This is all yours. Well, to be technical, it’s the banks’ property until you’ve properly paid off everything. Still — you’re your own landlord. Do whatever you want in your home! Ideally, take great care of it because your home’s condition is a reflection of you as a homeowner. A quality homeowner’s insurance policy in Ottawa and beyond will help protect this great investment of yours. Ideally, you’ll want to pay off your new home as quickly as possible, and this will be through monthly mortgage payments that are usually higher than the rent prices that you’re used to paying. Owning a home isn’t cheap, especially if it’s a brand new one. Our personal insurance experts only set you up with insurance policies that work for you — not us! After all, we’re insurance brokers that represent each carrier that we work with as opposed to direct representatives of a particular company. This means that we can help you shop for the best deals on all of your homeowners insurance needs! Contact Bradley’s Insurance today to get started.